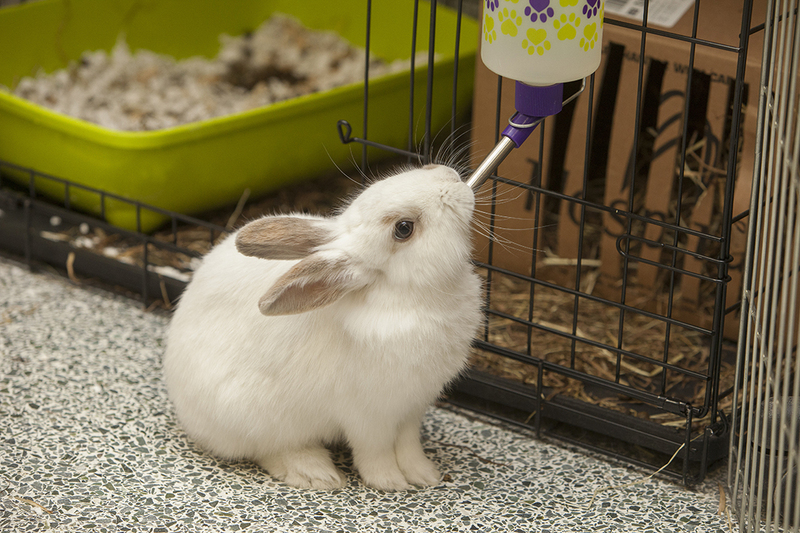 A vaccine is available to protect pet rabbits from rabbit hemorrhagic disease (RHD). Photo: Christina Weese. Veterinarians and rabbit owners in British Columbia are on alert for a devastating viral disease that has caused the death of hundreds of rabbits in the province this past spring. A lethargic rabbit with no appetite might be showing clinical signs of rabbit hemorrhagic disease (RHD). Within 24 to 36 hours, infected animals suffer from painful, internal bleeding that causes these otherwise silent creatures to scream in agony. This represents the shocking reality for rabbits that have been infected by RHD. It is a highly contagious calicivirus that specifically affects European rabbits. It can’t be transferred to people or other animals, and it does not appear to affect other species of rabbits that are native to North America. In addition to listlessness and a lack of appetite, rabbits affected with RHD can show signs such as a lack of co-ordination, behavioural changes or trouble breathing before dying. Infected rabbits are often bleeding from the nose at the time of death. Originally found in China in 1984, RHD has killed thousands of rabbits in Europe, Australia, Mexico, United States and now Canada. The rabbits were sent to the provincial Animal Health Laboratory where diagnostic team members confirmed the virus infection. The strain was identified by staff at the federal infectious disease lab in Winnipeg, Man. Dr. Jane Pritchard, B.C.’s chief veterinarian, assisted with the importation of over 1,000 doses of a European RHD vaccine to private practitioners on Vancouver Island and the Lower Mainland in mid-April. The injectable vaccine appears effective in preventing new cases, but with no way to treat infected rabbits, there is no way to stop the disease’s spread in the feral and captive rabbit populations. According to Misra, RHD is an incredibly hardy virus and can even withstand biosecurity measures such as disinfectant foot mats — a common practice used in international airports during the early 2000s when foot and mouth disease was prevalent on farms in the United Kingdom and China. With the recent B.C. outbreak, the virus was first identified in feral rabbits on Vancouver Island in the Nanaimo area and on the mainland (Annacis Island) near the city of Delta, B.C. Eventually, the disease was also detected in nearby Richmond. Around the same time, dead rabbits were also found in Courtenay and Comox on Vancouver Island. The proximity of outbreaks and the pattern in which they occurred have created a puzzle about just how the outbreaks occurred. Another mysterious aspect of RHD is that European rabbits younger than eight weeks old are reported to be immune to the virus. Schwantje says this didn’t appear to be the case in the B.C. outbreak since veterinarians reported baby rabbit mortalities, but when it does occur, it’s puzzling. Schwantje says there is no way to protect feral rabbit populations from RHD, but the best way to protect pet rabbits is to have them vaccinated for the disease. For more information, visit https://spca.bc.ca/news/rhd/. • European rabbits quickly became a huge pest for Australia’s farmers after the mammals were introduced to the country in the mid-1800s. In 1995 scientists brought the extremely durable and contagious RHD virus to a quarantined Wardang Island off the coast of South Australia to test the possibility of using it to control the country’s rabbit population. Despite their precautions, the research team failed to contain the virus; it spread to the mainland where it caused the death of 10 million rabbits in just months. • In 1988, RHD-infected rabbit meat was shipped from China to Mexico. In just three months, the virus spread to 159 rabbitries across the country. To control the virus’s spread, the Mexican government had to destroy 120,000 rabbits. Harrison Brooks of Fort Qu’Appelle, Sask., is a third-year student at the University of Regina’s School of Journalism. Brooks is the WCVM’s summer research communications intern.